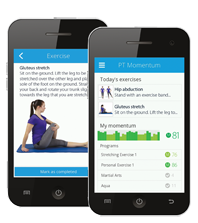 Our new PT Momentum mobile app encourages your clients to reach a daily exercise target and reminds them to exercise. Clear instructions, images and videos ensure your clients are doing their exercises correctly. The app is free for PhysioTools Online users and their clients. It is easy to create an exercise set to PT Momentum. Create the set in PhysioTools Online as usual and when you save the set, it will be sent to the PT Momentum app. Click here to print and save a short user´s guide. PT Momentum app works with Android and iPhone. The application can be downloaded by your clients free of charge from Google Play or the App Store. Currently PT Momentum is only available in the UK, Ireland, Finland and Sweden. However it will be available in other countries later.